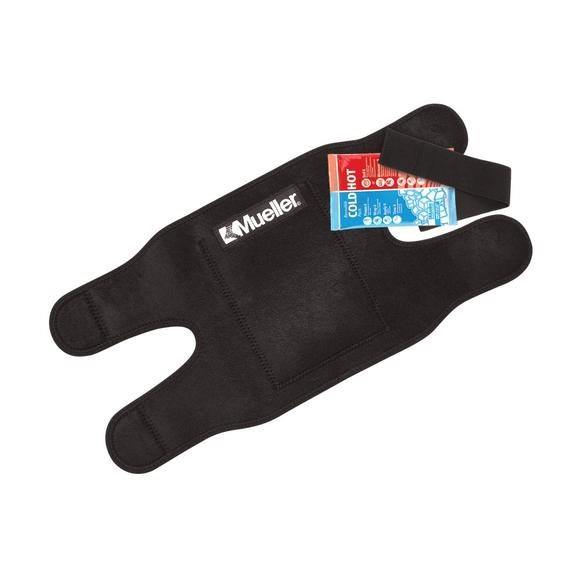 The slip-in pouch and removable extension strap make this Large Cold-Hot Reusable Therapy Wrap from Mueller the easiest and most versatile cold-hot therapy solution. Ideal for larger body parts like the knee, shoulder, back or thigh. The wrap pouch holds one 6" x 9" cold-hot pack and provides a safe protective barrier for your skin while applying cold or hot therapy. The slip-in pouch and removable extension strap make this Large Cold-Hot Reusable Therapy Wrap from Mueller the easiest and most versatile cold-hot therapy solution. Ideal for larger body parts like the knee, shoulder, back or thigh. The wrap pouch holds one 6" x 9" cold-hot pack and provides a safe protective barrier for your skin while applying cold or hot therapy. Recommended to help with the treatment of common sports or work injuries, and to help reduce swelling, relieve pain, and enhance rehabilitation of larger body parts.